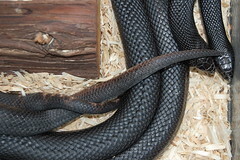 Without question, the snakes in our collection that generate the most questions about potential offspring are the black pine snakes. I’m sure that if I kept better track I’d have quite the waiting list by now. If they produced lots of babies, I’d sell every last one, and at a healthy price, too. Unfortunately, they only produced a single viable clutch, and that was back in 2002; the clutch produced last year turned out not to be viable. I’ve always wondered why we haven’t been able to replicate our success. Now yesterday we caught the two pine snakes in the throes of mating activity. I didn’t actually catch — or photograph — the actual act of intromission, but Lucifer certainly seemed to be trying, and was performing several stereotyped courtship behaviours as well. Fine and good — but it’s late February, which seems a little early. In past years, they were hibernating at this time, in separate containers. I wonder if our mistake — the reason why we’ve had such poor reproductive success — is because we’ve been hibernating them through their mating season?